Our mission at EMSSC is to foster individual player and team development through the game of soccer. This will help build strong players and competitive teams. We are dedicated to providing a safe and fun environment through our experienced and energetic coaching staff. Our vision at EMSSC is to teach individual and team responsibility through soccer related challenges. We expect positive character compliments from the peers within the community. We want to consistently educate the players through positive coaching role models about res ponsibility, accountability, and team work. We also expect a strong committed work ethic from both our coaching staff and players within the club. Week one of the spring soccer season brought us beautiful weather. I hope everyone had fun. This week we will be back to having coffee, cappuccino and hot chocolate in the concession stand. We also need volunteers for the concession area. Some of the teams have forms on when your teams duties are. Please sign up to help us out. Volunteering helps us keep our costs low. Check with your coach if you are available. Tuesday April 23rd is parade of teams at the Panther Pitch. More details coming soon. Spirit Wear is available to order up until April 15th. 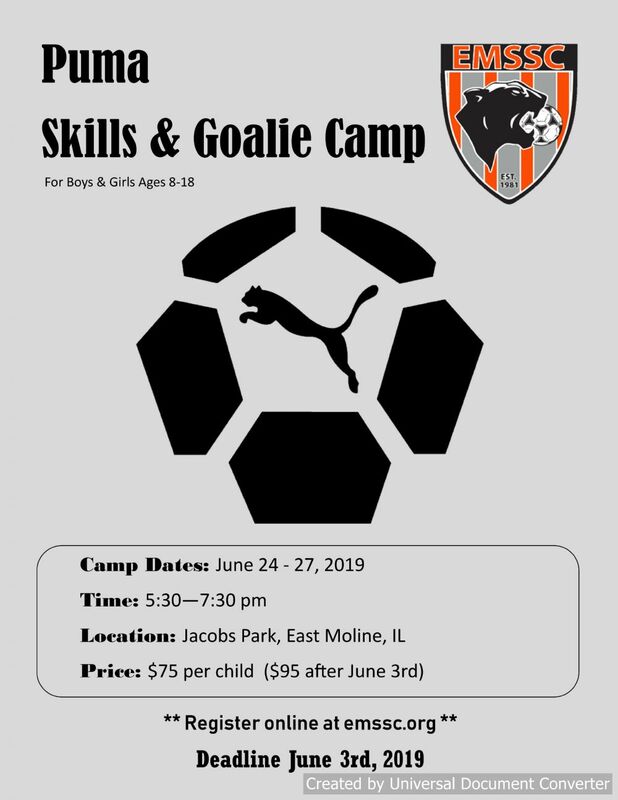 EMSSC is excited to announce its first annual Puma Skills Camp that will be held at Jacobs Park Monday, June 24th through Thursday, June 27th. Camp sessions will be nightly from 5:30pm to 7:30pm and open to players 8 to 18 years of age. The cost is $75 per player registered by June 3rd and $95 on or after June 4th. This camp will be run by the EMSSC Directors of Coaching and is designed to provide a fun and exciting environment to learn and develop a wide range of technical skills. There will be small sided games, individual competitions, and prizes, in an effort to drive the love and passion for this great sport. Camp will also include a specific goalie training program for boys and girls ages 10-18. This goalkeeper option is designed to improve footwork, positioning, form diving, aggressiveness, and communication. Camp members are asked to bring to each session a soccer ball and water bottle, and should wear soccer shoes, shin guards and soccer socks. The registration link can be found below or on our website, www.emssc.org. For additional questions, please contact the Director of Coaching, Mooch King, via email at . We look forward to seeing you all there! We will be selling these soccer scarves for $20 each, first come first serve. They will be available in the concession stand this weekend! Get one before they’re gone! This is a Rec Soccer League. Soccer should be fun. We appreciate you chose our club for your child to play soccer. We look forward to a great soccer season. We expect good sportsmanship from players, coaches and parents. We play soccer in the rain. We only cancel if there is lighting or our fields may be damaged. We will post all rain outs on our web site and send out mass emails and text messages. If a score is lopsided, we expect the other team to hold back and move players to try to make it more competitive and fun. It’s no fun for either team to have a score of 10 to 0. Parents sit on the opposite side of the field from the coaches and players. If we see you on the coach’s side, you will be asked to move. Dress for the weather. Layers are recommended. Do not sit behind the goal. No dogs allowed on the fields. No smoking around the concession stand or game fields. Have your child bring a water bottle to every practice and game. Shin guards are mandatory at all games. Have your child dress appropriately for the weather. Layers are always helpful. The fields are always colder or hotter than your house. Snack Pack: If you forget your child’s treats, we sell “snack packs” in the concession stand. A snack pack is a juice box and a treat. The treat can be a Rice Krispy treat, fruit snack, or animal crackers. Volunteer Schedule: We ask each team to volunteer at least one time in the concession stand during the season. This is for ONE HOUR. We do not hire employees, all of us are volunteers. This is how we keep your cost low. We need you to sign up and assist us. We do not expect the coaches to volunteer. They already volunteer by coaching your child. A board member will be in the concession stand to help you. This is very easy. WHEN YOU FAIL TO SHOW UP, FOR YOUR VOLUNTEER DUTY, A BOARD MEMBER HAS TO FILL IN AND MAY MISS THEIR CHILD’S GAME. Equipment exchange: If you have gently used cleats or shin guards your child has out grown please bring them to the soccer fields and place them on the soccer table near the concession stand. If you need shin guards or cleats take them from the exchange table. Parade of teams: April 23rd will be the parade of teams. All players and coaches will parade onto the soccer field between the JV and Varsity UTHS Boys soccer game. Players and coaches will stand with the teams for the National Anthem and will be announced as they exit the field. Players and coaches will be admitted to the game for free. More details will be sent out closer to the date. Concession Items: The concession stand is featuring Whitey’s Ice Cream and grilled items to include delicious brats, cheese burgers and pork tenderloins. For breakfast try our Happy Joes breakfast pizza, donuts, or the best hot chocolate in East Moline! We now accept debit cards at the concession stand. If you have a problem, concern, or suggestion please contact a board member. Normally a board member can be found in the garage or concession stand. Please do not take your complaints to social media. Do not post negative comments about other players, coaches teams or the program. If you have a complaint, let us know. Watch our web site for up to date information. If you change your phone number or email address, please let us and your coach know so we can notify you of important information. Thank you for putting your child in our program. We appreciate the time you are giving to attend practices and games. Thank you for your support! We look forward to a great soccer season. March 24th: Coaches meeting 1:00pm at the Silvis Police Department. The volunteer schedule is now posted for all Travel Families. Deadline to sign up is April 4th. Visit our web page under the Volunteer tab on the left side of the page. This spring season, we require one volunteer spot per player. This can include field day. If you are not able to volunteer during our travel times, we can arrange for volunteer duty during the Rec time or find another volunteer duty for you. If you do not sign up for your volunteer duty, you will receive a fine. We appreciate all of our members who volunteer. Our club relies on volunteers to operate and keep our cost low. If you have any questions, please let me know!! Thank you for choosing our club and volunteering!